Old genealogies record that Cadogan had many children, including a number of sons. Some of these (there are more to add who appear in old records and the work of Peter Bartrum), along with notes of families descended from each are detailed below, but not in any particular age order. Many branches have intermarried over the generations, with the result that quite a lot of the families below are descended from more than one of Elystan’s grandsons. A simple example of some of these sort of interconnections is shown at the bottom of this page. One thing that is clear, particularly from our gathering in October 2010, is that the descendants of Elystan stretch far and wide and reside right across all parts of the community of Radnorshire and the regions around it, both sides of the border, let alone places much further afield. It is probably true to say that a very large number of people in this part of the country descend from or have a connection with the ‘tribe’ of Elystan. Perhaps it was this that enabled us to enjoy such a happy gathering in 2010, with its warm and welcoming atmosphere and the character of a very large family community get-together. The old princely families haven’t disappeared, they became yeomen, farmers, soldiers, professionals, and workers in all trades and industries, and their descendants can be found within the community of people living across Wales and the rest of the Britain today, and the diaspora around the world. The families listed below are the most easily found examples, grouped under the names of each respective son of Cadwgan ab Elystan from whom they have traditionally been said, or are known to be descended. of Croesgynon (Llanbister parish). We have still to ascertain the precise descent of the Lloyds of Trebroden. Beddoe of Bransley & Withypool, Cleobury Mortimer, Shropshire and Beddoe Springs, Sabinetown, Texas, U.S.A.
line of descent from Elystan, like the Bedoes from Ieuan Philip ap Bedo coch of Llanwrthwl (see below). root after all. The work is not yet complete, but it has revealed a series of interesting connections between these Beddoe/oes. * = families that Philip Yorke mentions in his book as likely to have become extinct; it must be remembered that he wasn’t always correct in his assumptions! 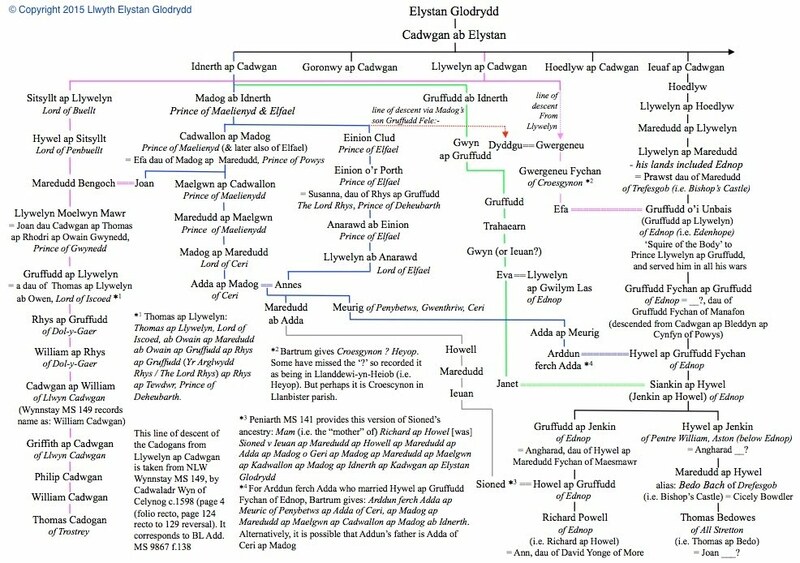 As mentioned at the top of this page, many people researching their descent from Elystan are likely to find that they discover a series of interconnecting family lines resulting from inter-marriage between different branches descended from sons of Cadwgan ab Elystan. The highly simplified chart below provides a perfect example of this, although even more complicated examples do exist. Full details of siblings in each generation and of source material for these descents have been deliberately omitted to keep the illustration simple. Peter Bartrum’s work on Welsh genealogies will reveal most of what is shown below, along with other sources, some of which do disagree with each other - the note below on Peniarth MS 141 is just such an example. The line of descent marked in green is also taken from a transcription of Peniarth MS 141 and does not appear to agree entirely with the line given by Bartrum taken from other sources. The line of descent shown below for the Cadogans of Llwyn Cadwgan, from Llywelyn ap Cadwgan, is taken from National Library of Wales Wynnstay MS 149, which is the work of Cadwaladr Wyn of Celynog c.1598 (folio recto, page 124 recto to 129 reversal). It corresponds to BL Add. MS 9867 f.138. Other sources and records have slightly differing details. options from reliable and trusted sources, we would be very pleased to hear from you!